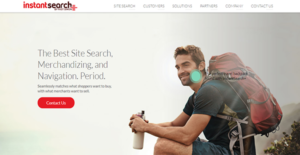 InstantSearch+ is an integrated and user-friendly eCommerce search tool for web stores. With it, you can adroitly assist your customers in finding the merchandise they are looking for or recommend items that may also be helpful to them. Therefore, you can look forward to fast results that you can measure. Moreover, InstantSearch+ does not require coding skills. You can save money since you do not have to hire developers and you can instantly utilize the tool in your online shop. As such, you can further improve your bottom line and increase conversions at a faster pace. Furthermore, InstantSearch+ can connect with the major eCommerce platforms. Thus, whichever website your store is hosted in, you can rest assured that you could use the tool with it. And in case you are running a custom web store, you could still integrate the search solution with it. InstantSearch+ is more than a search engine. You can also employ it to highlight products that are included in your running promotions to attract customers’ attention to them. Because of that, you can expect an increase in interest in your promoted merchandise due to their amplified visibility. When shoppers search for a product on your web store, InstantSearch+ gives them results that prioritize products you want to sell. With this, you can help customers find the item they need while unobtrusively putting emphasis on certain goods. InstantSearch+ is an intuitive tool that can make intelligent guesses as to the kinds of items your shoppers are looking for. In fact, it can automatically complete search terms and even look for synonyms to match additional relevant products. As such, shoppers can find their preferred items faster and pay for them at a more accelerated pace. As InstantSearch+ does not require coding skills to integrate with your website, the process is expedited. It speeds up your time to market, allowing you to beat the competition to gain more followers and customers. Additionally, the eCommerce search tool works with major platforms like Magento and Shopify. This means that if you are already in the supported web shops, then setting up will be a breeze. However, if you are utilizing a custom online store, then Fast Simon can work with you to help you integrate the tool. If you are interested in InstantSearch+ it may also be beneficial to examine other subcategories of Best Site Search Solutions collected in our base of SaaS software reviews. Organizations have unique wants and requirements and no software platform can be just right in such a condition. It is futile to try to find a perfect off-the-shelf software system that meets all your business wants. The smart thing to do would be to modify the application for your special needs, worker skill levels, budget, and other factors. For these reasons, do not hurry and pay for well-publicized trendy solutions. Though these may be widely used, they may not be the ideal fit for your specific needs. Do your groundwork, look into each short-listed application in detail, read a few InstantSearch+ reviews, call the maker for clarifications, and finally select the product that offers what you need. How Much Does InstantSearch+ Cost? We realize that when you make a decision to buy Site Search Solutions it’s important not only to see how experts evaluate it in their reviews, but also to find out if the real people and companies that buy it are actually satisfied with the product. That’s why we’ve created our behavior-based Customer Satisfaction Algorithm™ that gathers customer reviews, comments and InstantSearch+ reviews across a wide range of social media sites. The data is then presented in an easy to digest form showing how many people had positive and negative experience with InstantSearch+. With that information at hand you should be equipped to make an informed buying decision that you won’t regret. What are InstantSearch+ pricing details? What integrations are available for InstantSearch+?